Here is a brief time line of HMC’s history – see below for a potted narrative! Methodism was the first organised Christian denomination in Helsby. Samuel Burgess, a farmer who lived at Underwood, Chester Road, started a Sabbath school in 1800 in a room in one of his farm buildings; the room was also used for divine worship. 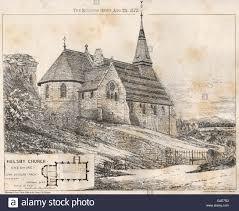 George Slater (Slater’s Chronicles of Lives and Religion in Cheshire, 1891) recorded that, around 1840, “the Wesleyan chapel in Helsby was a little thatched cottage, close to the road, and one of the meanest little buildings in Helsby”. Slater also commented that on the occasion of his first visit to Helsby in 1837 “there was a good number of earnest praying people”. In 1835 the great division in the Methodist Church took place, and Samuel Burgess and almost the entire society and congregation joined the seceders known as the Methodist Free Church, leading to the comment in Bagshaw’s Cheshire Directory for 1850 that “there are two Wesleyan chapels in Helsby”. These are not the existing chapels, which were built later. A photograph of the thatched cottage mentioned by Slater is in the Helsby Women’s Institute Scrapbook compiled in 1951. The building that was Trinity Church (opposite the Horse and Jockey public house on Chester Road), now a private dwelling-house, was erected as the Wesleyan Methodist Chapel in 1853. The seceders built their own church in 1858 (the present Methodist Church Hall); it was known as the United Methodist Free Church, or Zion Chapel. Mr. Thomas Lewis, a great friend of Samuel Burgess and a local preacher for many years, gave the land for it, did a large share of the work and paid a large proportion of the cost. The Primitive Methodist Chapel (known as “Avenue”), on Chester Road at the south-western end of Robin Hood Lane, was built in 1902. Thus for the first half of the 20th century there were three Methodist places of worship in Helsby. Over the years (the dates are not known) the 1858 building (known later as Central) had extensions at the front to provide a vestry and organ loft, and at the back to provide a Sunday School. Also, as the three Methodist congregations grew closer, it became clear that to amalgamate was the right thing to do. However, the size of Central was still restrictive, and a decision was taken in the early 1960s to build a new church close by, together with a Manse (the Manse at the time being 18 Chester Road), and to retain the original building as a Sunday School. This was completed in 1965, with Trinity Chapel having closed in 1963 (somewhat prematurely owing to the boiler’s failing!) and the Primitive Chapel having closed in 1964, with both congregations transferring to Central, now known simply as Helsby Methodist Church. Some years later, it became clear that the Sunday School premises were inadequate, and a further large extension was built, which was opened in 1976. The original building was later found to be in a poor structural state, with rot in the floor joists and the roof. A refurbishment programme was undertaken, with the different floor levels in the two parts of the building being made the same, to give a very large room. In 2005-6 a very large building programme was carried out to link the church with the Sunday School premises, thus providing much more space for church and ancillary activities.